“I hugely enjoyed this second thriller in Alison Morton’s trilogy. I find I’ve become quite attached to the beautiful, tough and resourceful Carina. Alison Morton has constructed a beguilingly convincing fictional empire. Roma Nova is a matriarchal dynasty where the women who hold sway are strong, intelligent – and anything but soft and fluffy. 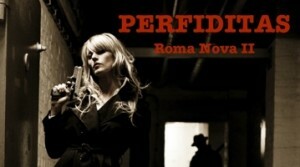 Watch the PERFIDITAS book trailer. Buy PERFIDITAS at any of these retailers.